In the past, businesses would have to wait to see whether Congress would raise the deduction. Because they were not sure what Congress would do, they could not safely make end-of-year purchases the way they wanted to. 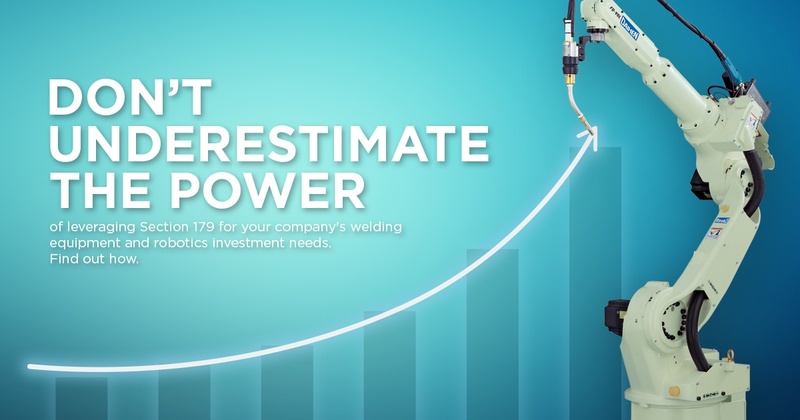 Now that we know you are going to be able to deduct the full purchase price, you can choose to invest more in robotics and welding equipment in an effort to raise the value of your company and offerings. Trying to negotiate deals may be easier as well and taking delivery of new equipment no longer needs to happen right in the middle of the break for the holidays. These are all good changes to make it easier on businesses, and help you advance your interests while serving customers. Another benefit under Section 179 is the extension of bonus depreciation, which is taken after the actual cap has been reached. Originally this depreciation was set to expire at the end of 2014, but it was extended in order to provide businesses with more significant help for making improvements. Quality welding equipment and robotics are so important to manufactures today and in the future. This higher level of depreciation will allow for increased benefits for companies nationwide. New and used equipment and off-the-shelf software are all included in the Section 179 deduction and the bonus depreciation, making it easier for companies like yours to get what you need along with tax breaks you can use. The current 2018 deduction limit for Section 179 is $1,000,000, and the spending cap is $2,500,000. The bonus depreciation is now 100 percent. Section 179 is a great way to give a true tax incentive to your business. You can save a lot when you invest in your businesses by upgrading your robotics and welding equipment to drive continued improvements and maintain cash flow you can use for other things. When a tax break really helps you keep more money in your pocket, and not just on paper, the opportunities to improve your company's bottom line and support your clients with greater value grow exponentially.